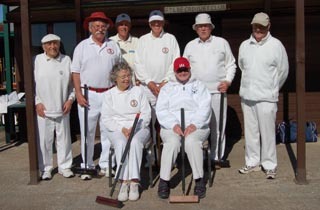 With Betty being called up for National Service,it came to Geoffry to fill the breach for the final match of the year. The team enlisted the help of a newcomer in the shape of Nathan who has shown his skills over the past couple of months. An early start was soon thwarted with our directional expertise at their lowest as we were soon lost. However. Nathans phone and Ian's satnav had us at Coronation Park in plenty of time for a cuppa. The first games highlighted to all of us the speed of the lawns as many croquet shots finding the boundaries an easy target.Nathan played his fist game and won 6 - 4 against an experienced Bob Whittle with 4 bisques in fact he was the only winner in the first round. OK so the next round was the same only Nathan won but he did have 9.5 bisques. Time for lunch and a chat but back to the match. Round 3 and a new winner as Ian beat Bob 14 - 9. Fylde were on a losing streak but still game for it. Round 4 saw a different side as Ken beat Bob, Nathan beat Chris and Tony was easily beaten by Ian 14 - 2. So Fylde finished losing 10 - 6 but as usual we all had a good day. Well done to Nathan winning 3 out of 4 games on his debut. There was a close call for a ball off the lawn. Fylde fielded an impressive team for this match with no bisques available at all. Peter said he was going to enjoy the match and he did just that, winning 2 games using his peels and giving us who watched a lesson on playing the game. Liz having a forest of bisques against her in every game showed how good she is by winning all 4 games. The captain owes her a Mars bar. Ian and Ken were overwhelmed by the amount of bisques against them and neither of them could win an arguement let alone a game. 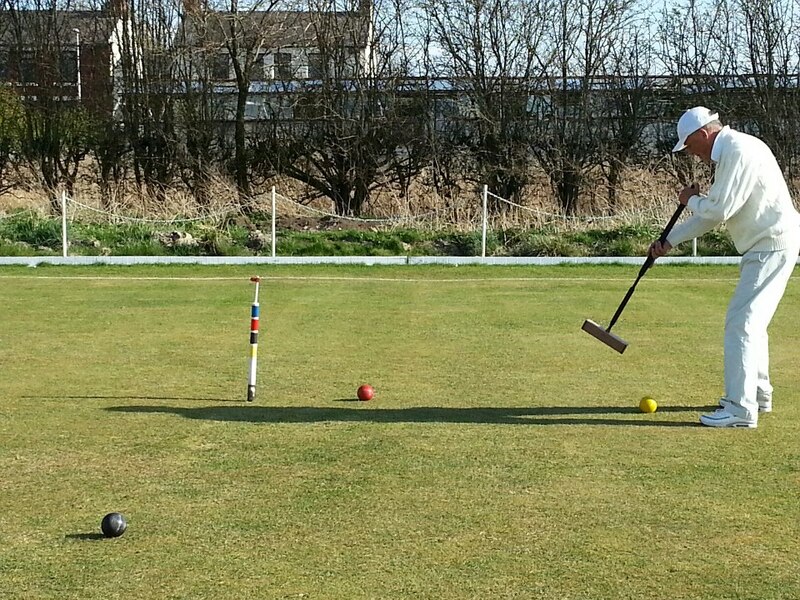 So the match ended with a Fylde defeat 10-6 but the company was good and the weather held for another fine croquet day. Westmorland miscalculated the travel time, arriving before 9am! Among their comments - It's quicker to get here than Levens. Many thanks go to Liz who prepared lunch al fresco for us and, very kindly, did the washing up. Round 1: Three Fylde winners - Betty, Leonard and Philip. Score 3-1. Round 2: A reversal of fortunes with Westmorland winning 3. Philip won his game 8-2. Leonard's and Catherine's games were close - golden hoops - 7-8 and 8-9 respectively. All level at lunch 4-4. Round 3: Leonard was the only Fylde winner with an emphatic 10-2. Catherine again lost at golden hoop against Mike. Betty narrowly missed out. In Philip's game, time went on Ian's turn, with Philip's balls split up. Ian was two ahead. Philip managed to run Hoop 1 but then his execution went awry, requiring him to take off to white near corner 3. As if by magic, he got behind white and rushed it to Hoop 2. His perfect execution got to front of hoop and he prepared to draw level. A fraction out on the swing, pink clanged. Ian was the winner. Score going into the last round: 5-7. Fylde needed all four games to win. Round 4: Betty stormed ahead and accomplished a 14-2 win over Dave in about 20 minutes. Using 3 bisques, Catherine took blue round to peg in 13 minutes and eventually got her first win of the day 14-3. Score 7-7. Round 4 (contd): Leonard fought valiantly against Sue but, as in her first game, she finished 7-14. Philip and Mike were battling it out on the far lawn and it was difficult to see who had won. Again, time had gone and it was a golden hoop challenge. As Philip returned to the Pavilion, he gave the captain the thumbs-up!!! Draw. which both teams felt was a good reflection of the day's close play in many games. Six games were close, with only four (2 for each team) ending in both balls pegged out. In total, Fylde scored 133 hoops to Westmorland's 107. Philip was man of the match with 3 wins but Betty deserves a special mention as a good team player, prepared to come and play against strong opponents with an extra bisque each. Learning point: If your opponent leaves you with a hampered shot ie. unable to strike the ball to hit your partner ball, you are entitled to a lift on the hampered ball - Law 13(c). If in doubt of a Law, get a referee. 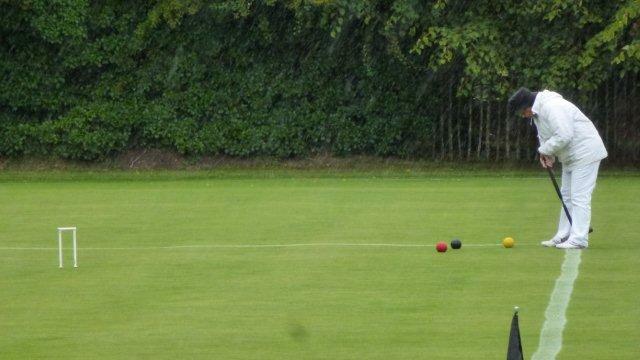 The first round got off to a shaky start for Fylde with Bowdon winning three out of the four games. Ian was left flabbergasted by Anne's superb performance as she won 14 -4 with 35 minutes still on the clock and her 3 and a half bisques remaining, left untouched. Betty tried valiantly to win her game giving away 7 bisques to Margaret Moss but unfortunately time was the victor losing 7-5. The only winner for Fylde was Leo who was on top form winning 12-6. Geoffrey could not take advantage of having 6 bisques as the lawns proved far too fast for him, he did some excellent half rolls setting himself up for the pivot, except the forward ball continued to go off on numerous occasions. Score at lunch 5 -3 to Bowdon. As clouds gathered overhead a wonderful lunch was served. By the time lunch had finished the skies turned blue and sunny again in pathetic fallacy. Inspired by a pint of the finest ale Leo beat Anne 8-5. Ian had second wind against Carol after being on hoop one and hoop two, whilst Carol was on Rover with both balls, but in true Fylde grit fashion Ian dug in and eventually beat Carol 14-13. Betty beat Nan 14-6 (giving away 7 bisques).Geoffrey unfortunately could not shake off Margaret who used her 6 bisques to good effect. Carol and Betty played a very defensive cat and mouse game, but Carol nailed it in the end with a score of 8-7.Ian and Nan had a similar tussle with a score of 14-12 to Bowdon. Leo was the star for Fylde with his third win of the day against Margaret, winning 8-5 for Fylde. Anne played well to beat Geoffrey 8-4. Some close games played with good croquet spirit and tans were topped up in the glorious sunshine. Nice weather but a little cool. Georgina was returning to play after a back problem over the winter. Many thanks to Liz who came to help with catering and washing up. In the first round, Philip was the only Fylde winner (against Georgina) but Ken's game was close, losing to Roger 10-14. Catherine was the only Fylde winner in the second round against Georgina and Leonard came close to beating Roger, score 11-12. Ken won both his remaining games (against Jack and Georgina). Leonard again came close scoring 8-10 against Georgina and 7-8 against Jack. Roger and Glyn were on top form, winning all their games. In his last game, Glyn took a bisque at Hoop 1 and ran his ball through 1 and 2. Glyn left his shoes behind in the changing room. These are now enjoying board and lodging at a local Bass house. A lovely, sunny day with a bit of a chilly breeze. Geoffrey and Philip set out the lawns whilst Leonard cleaned up the furniture. Barbara very kindly helped with the coffee and tea production. We were not aware at the start of the day that Fylde had lost three home games to Southport since the start of the season, Advanced, Midweek and Golf. Barbara, on top form, won all her games getting the full 14 points in three of them so Fylde needed to work hard on their other chances and kept hopes alive by staying in front all day. Fylde got off to a great start winning three games right away. Philip and Margaret D were drawing 7-7 on time. Philip went on, made an excellent very long roquet and scored the Golden Hoop. The other wins were close 9-8 and 10-8. In the run up to lunch, Margaret D played determinedly and pegged out both her balls. Geoffrey had a good win against Terry 7-2 and Philip won his second match. In the first round after lunch, Geoffrey and Leonard completed their brace of wins each, taking us into the final round with Fylde still leading 7-5. Two wins were needed to seal victory. Catherine at last found some of the form from her first game and won her last match against Margaret D. Geoffrey and Leonard had not managed to fend off Barbara and in-form Margaret F. So the score was 8-7. An error by Terry let Philip back in after time and Philip kept cool, despite the large audience, to complete hoop running and peg out both balls. Thanks go to Barbara and Terry who were generous with their coaching and tips through the day and to the team who have got us off to a flying start!